In 1920, veterans groups played an active role in orchestrating Memorial Day observances in towns across Connecticut. As had been the case for decades, remaining members of the Grand Army of the Republic (GAR), an organization composed of Civil War veterans, took traditional place of pride alongside the Sons of Veterans, assemblies of men descended from individuals who had fought for the Union cause. After all, Memorial Day had been instituted on a national level by the GAR on May 30, 1868, at Arlington Cemetery. 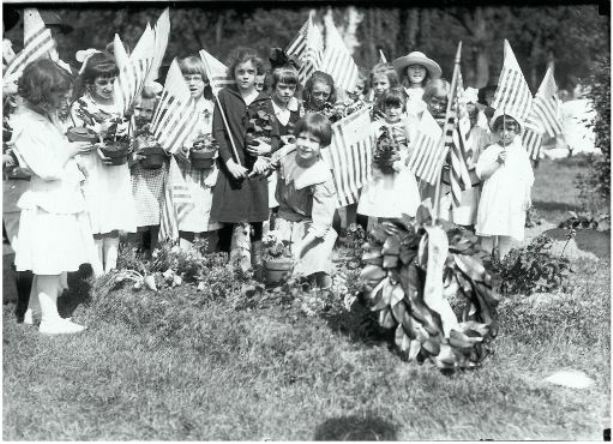 Known then as Decoration Day, it adopted earlier local customs, practiced in both the North and South, of remembering the Civil War dead by adorning their graves with wreaths, flags, and flowers. So, as they had done for years, groups dedicated to sustaining public remembrance of the Civil War organized and marched in parades, gave speeches, attended religious services, and gathered school children to help mark the graves of fallen soldiers. But, this year, they were not alone. In many towns, a new group, the American Legion, joined in the making of plans. As the day will be celebrated in Windsor in a manner never attempted before, and as it is the first Memorial Day in which members of the World War have taken part and assisted in decorating the graves of their own comrades, the legion hopes that every ex-serviceman will turn out. In some locales, with the number of Civil War vets dwindling, the American Legion assumed primary organizational duties alongside other civic groups. “In the past six years the ranks of Grand Army posts have thinned so that barely a nucleus remains,” reported the Courant of Hartford’s Memorial Day parade and observances. Veterans of the Spanish-American War (1898) numbered fewer as well. New to the ranks were Connecticut’s veterans of the World War, many who paraded for the first time in 1920.